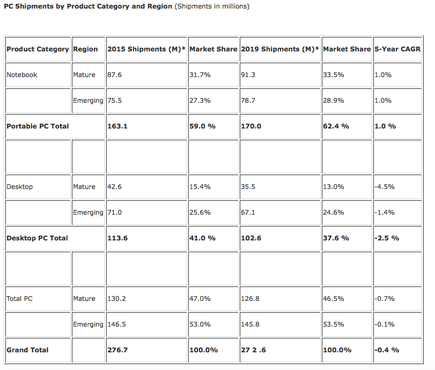 Worldwide PC shipments are expected to fall -10.0 percent in the fourth quarter of 2015, pulling year-over-year growth for all of 2015 down to -10.3 percent. According IDC, short-term headwinds like the strong dollar, depressed commodity prices, and existing inventory have also lowered the outlook for early 2016, although shipments are still expected to stabilise by the end of 2016 and grow slightly toward the end of the forecast as commercial replacements rise. Disruptions from political and economic transitions will have a particularly large impact on Japan, the Middle East and Africa (MEA), Central and Eastern Europe (CEE), and Latin America. Japan and MEA in particular will experience double-digit lower growth over the next year or more, while the CEE and Latin America regions have a short-term outlook that is in the high-single-digits lower. In contrast, the forecast for the United States, Western Europe, and Asia/Pacific (excluding Japan) will be only slightly lower, and Canada improved slightly. Beyond short-term declines, IDC remains optimistic that replacements of commercial and consumer systems will ultimately stabilise the market and even drive growth. 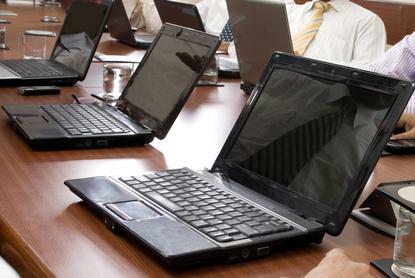 Once commercial adoption of Windows 10 accelerates, and in combination with upgrades to steadily ageing consumer PCs, IDC expects demand for new PCs to improve for several years as replacements will also be boosted by the end of support for Window 7, just as the end of support for Windows XP boosted shipments in 2014. Declining tablet volume, and minimal growth in mobile phones (despite the continuing shift to smartphones) will also reduce pressure for consumers to spend on non-PC devices. “Despite the substantial shift in spending and usage models from PCs toward tablets and phones in recent years, very few people are giving up on their PC - they are just making it last longer,” says Loren Loverde , Vice President, Worldwide Tracker Forecasting and PC research, IDC. “The free upgrade to Windows 10 enables some users to postpone an upgrade a little, but not indefinitely. Some consumers will use a free OS upgrade to delay a new PC purchase and test the transition to Windows 10. “However, the experience of those customers may serve to highlight what they are missing by stretching the life of an older PC, and we expect they will ultimately purchase a new device. While detachable tablets are expected to grow quickly, Loverde says they are still a relatively small part of the market. As a reference, combining detachable tablets with PCs would boost growth by roughly three percentage points - this would result in a trend of declining volume from 2012 to 2015, followed by about one percent growth in 2016 and slightly higher gains in subsequent years. “Despite declining competition from slate tablets, demand for PCs has remained price-sensitive and slow,” adds Jay Chou , Research Manager, Worldwide PC Tracker, IDC. “Nonetheless, the market is still evolving in more positive ways. 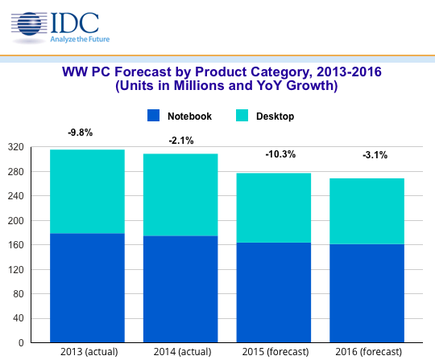 IDC expects continued growth for All-in-One desktops as well as Convertible and Ultraslim notebooks.